"...the CO2 restrictions implied in the EPA regulation would have serious economic, employment, and energy market impacts at the national level and for all states, and that the impacts on low-income groups, the elderly, African Americans, and Hispanics would be especially severe."  Significantly reduce U.S. GDP every year over the next two decades, and by 2030 GDP would be about $500 billion less than in the reference case – which assumed no EPA carbon restrictions. AAEA supports EPA's Endangerment Finding as a reasonable response to the U.S. Supreme Court ruling to examine the potential of greenhouse gases to harm human health. In the absence of Congressional legislation, AAEA also has no choice but to support the subsequent promulgation of regulations to mitigate damaging climate change. Moreover, as the MIS report states, "No comprehensive analyses of the economic impacts of the EPA Finding have thus far been conducted," so we believe that until such a comprehensive analysis has been conducted, numerous confounding variables would appear to make it difficult to impossible to draw hard conclusions. Two of those variables of most concern to us are: 1) the impact of innovations that would result from monetizing carbon dioxide and other greenhouse gases, and 2) potential reduction in negative health impacts if governmental action by the U.S. motivates other nations to act. Our concern is that EPA appears to be delaying regulations and backing away from an economy-wide regulatory framework. We are also concerned that EPA regulations should include provisions for 'anyone' to hold and trade allowances and offsets if they ultimately adopt a Cap-and-Trade regulatory framework. Since 2005, Esurance has planted 85,429 trees - that's about 53 trees per day. Just in 2009, the company funded the planting of 9,162 trees with partners, American Forests, EarthCorps, Friends of the Urban Forest, Greening of Detroit, Park People, T.R.E.E., Inc., and the Texas Trees Foundation. We also planted 5,520 trees with claims partner HSG as part of the Save a Windshield, Plant a Tree program. Esurance works with NativeEnergy to offset 100% of electricity use in each of our office locations nationwide. The offsets are used to purchase renewable energy credits through the Langdon Wind Energy Project, and in 2009, totaled 4.4 million kWh of electricity. We also offset the carbon emissions from our fleet of hybrid claims vehicles through reforestation projects in Louisiana. Last year, we estimated that the CO 2 emissions we offset were equal to 631.6 tons. In 2007, we sponsored Live Earth, a concert series that took place on all seven continents and focused on raising awareness about climate change. The concerts resulted in the creation of guidelines to help events and facilities reduce their carbon footprints. Esurance adopted those guidelines, which include actions like recycling, using energy efficient lighting, and alternative fuels, and mandated that all our sponsorship partners implement at least three items from the list. In the summer of 2009, as the green sponsor for two popular music festivals, Sasquatch! Music Festival and Monolith Festival, we put the guidelines to the test. At the Sasquatch! Music Festival in George, Washington, we focused the majority of our efforts on recycling and were able to keep 4.5 tons (9,000 lbs) of waste out of landfills. That’s enough to cover 20 football fields. Additionally, the festival was wind-powered to offset the CO 2 emissions created by artists, attendees, and staff traveling to and from the event. And, to counter the energy used by the festival itself, we purchased 1,406 tons of CO 2 offsets from dairy farms around the Pacific Northwest. 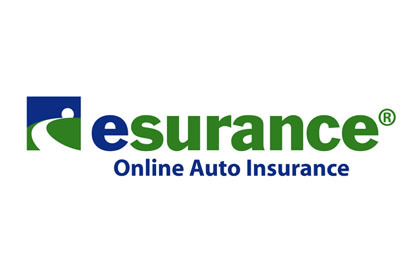 AAEA has not been compensated by Esurance and is not endorsing the service. But AAEA does believe that money is speech. AAEA President Norris McDonald attended the signing of the Omnibus Public Land Management Act of 2009 at the White House a year ago today. 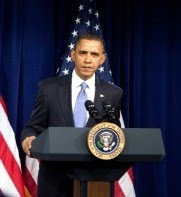 The bill signing ceremony was held in the East Room and President Obama gave a speech before sitting down to sign the bill. Secretary of the Interior Ken Salazar spoke before the bill signing too. House Speaker Nancy Pelosi and Senate Majority Leader Harry Reid also attended the signing. Council on Environmental Quality Chairwoman Nancy Sutley and NOAA Administrator Jane Lubchenco were also in attendance. Providing geospatial technology and environmental consultation to public/private entities, academic institutions, and non-profit organizations. Established 1992. Congress failed to approve $1.15 billion by a March 31 deadline so now the Obama administration cannot allocate $1.25 billion to settle decades-old discrimination lawsuits with black farmers. The deal, one of the largest civil rights settlements in history, was to compensate black farmers left out of federal farm loan and assistance programs due to racism. Lawmakers left for a two-week break on Friday without approving the deal, leaving it in limbo. 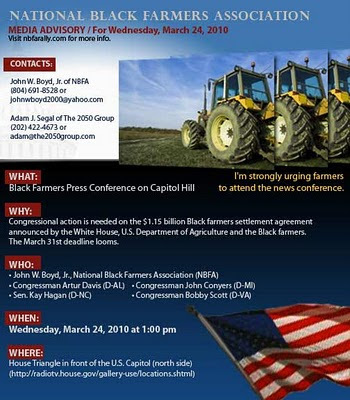 John W. Boyd, Jr., Founder and President of the National Black Farmers Association appeared on CNN news network on 3/28/10 to discuss the Black farmers settlement and the need for Congress to appropriate the funding. WASHINGTON, March 31, 2010 - On Feb. 18, 2010, USDA and DOJ announced a historic settlement agreement to resolve longstanding civil rights claims against the U.S. Department of Agriculture. While the settlement agreement includes a March 31 'opt-out' provision for the plaintiffs, the two departments remain committed to resolving this issue in the weeks ahead. "The Administration remains dedicated to the enactment of the Pigford settlement legislation and is committed to working with Congress to find an appropriate vehicle to provide funding. I have met with and talked to key stakeholders and members of Congress reiterating the Administration's ongoing efforts to close this chapter in the history of the department." AAEA Nigeria opened in 2005 and we have added a Kenya Office this year. 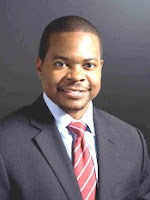 AAEA Nigeria is headed by Ifeanyi Joshua Ezekwe and AAEA Kenya is headed by Boaz Adhengo. AAEA Nigeria is dedicated to protecting the environment in Nigeria, enhancing human, animal and plant ecologies, promoting the efficient use of natural resources and increasing Nigerian participation in the environmental movement. AAEA Nigeria's main goals are to deliver environmental information and services directly into communities. We work to clean up neighborhoods by implementing toxics education, energy, water and clean air programs. AAEA Nigeria includes a Nigerian point of view in environmental policy decision-making and resolves environmental racism and injustice issues through the application of practical environmental solutions. 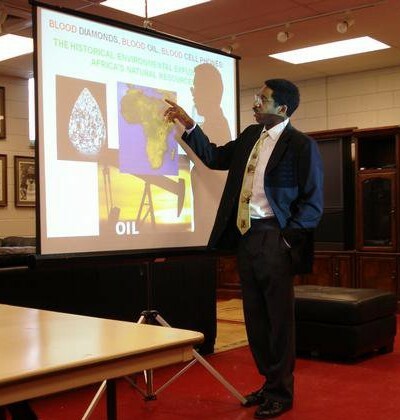 We are Nigeria's only environmental organization headquartered by an African American-led environmental organizations. AAEA Kenya is dedicated to protecting the environment in Kenya, enhancing human, animal and plant ecologies, promoting the efficient use of natural resources and increasing Kenyan participation in the environmental movement. AAEA Kenya's main goals are to deliver environmental information and services directly into communities. We work to clean up neighborhoods by implementing toxics education, energy, water and clean air programs. AAEA Kenya includes a Kenyan point of view in environmental policy decision-making and resolves environmental racism and injustice issues through the application of practical environmental solutions. We are Kenya's only environmental organization headquartered by an African American-led environmental organizations. 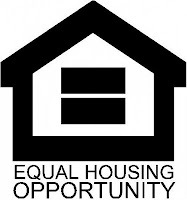 The National Urban League's has issued its annual State of Black America 2010 report, which shows chronic unemployment in minority communities that is almost twice that of whites and fuels wider equality gaps in areas of education, housing and social justice. 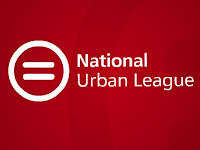 The Urban League suggests that if there is not a jobs surge in the nation to address the unemployment crisis in urban America, minorities will fall even further behind or totally get left out of recession recovery efforts. And if recovery misses the communities that are hurting the worst, there can be no real economic recovery for the nation. 5) Tax incentives for clean energy equipment manufacturers who employ individuals in targeted communities. The Urban League's I AM EMPOWERED web site shares personal stories about the effects of the unemployment. Following the press conferencea State of Black America luncheon includes panelists Donna Brazile, Democratic political strategist; Karen Finney, political consultant; David A. Wilson, founder and managing editor of The GRIO.com; Forest Harper, Pfizer senior executive; and Robert Traynham, host of Roll Call with Robert Traynham. "We Count! The Black Agenda is the American Agenda"
Today, broadcaster Tavis Smiley hosted African American leaders at Chicago State University at the Jones Convocation Center for a forum titled, "We Count! The Black Agenda is the American Agenda" that included panelists Rev. Jesse Jackson, Nation of Islam Leader Louis Farrakhan, Cornel West, Michael Eric Dyson, Ron Walters, Bennett College President Julianne Malveaux, Policylink CEO Angela Glover Blackwell, Former Alderman City of Chicago Dorothy Wright Tillman, author of "Brainwashed: Challenging the Myth of Black Inferiority" Tom Burrell and Chicago State U Student Government Association President Raven Curling. Although earlier this year, Smiley announced he would no longer host his annual State of the Black Union symposium, he quickly organized this syposium out of a conflict stemming from a February White House meeting between Obama and leaders of three of the nation’s prominent civil rights groups. Smiley felt that Rev. Al Sharpton, the NAACP’s Benjamin Jealous and National Urban League’s Marc Morial were publicly backing away from pressing President Obama on addressing a Black agenda. The resulting radio clash between Sharpton and Smiley drew national attention. So there appears to be two camps forming: 1) loving aggressive critics and 2) mild critics closely allied with President Obama. This dichotomy can be seen by those invited but not attending: Rep. Bobby Rush (D-IL), Valerie Jarrett, Marc Morial, Ben Jealous, Al Sharpton, and Barbara Lee. We would like to add that two important constituencies rarely represented at these types of meetings are Black business representatives and conservative Blacks. Rev Jackson and Angela Glover briefly mentioned green jobs related to mass transit availability and construction. Although advertised to be covered live on C-SPAN, it was preempted by coverage of the health care legislation being debated in Congress. It was covered live on C-SPAN's website from 8 a.m. through 1 p.m.
A new study just published in Environmental Science and Technology by Stanford's Mark Jacobson adds a slight twist to this standard view. Older research has found that local "domes" of high CO2 levels can often form over cities. Jacobson found that these domes can have a serious local impact, such as worsening the effects of local air pollutants like ozone and particulates, which cause respiratory diseases and the like. Jacobson estimates that local CO2 emissions cause anywhere from 300 to 1,000 premature deaths in the United States each year. And presumably the problem's much worse in developing countries. These conclusions support the Cap-and-Trade approach in our opinion. To the extent we can reduce the CO2 domes over cities, probably during inversions, we can increase the health of human living in those areas. The bill which passed Wednesday contains about $18 billion in tax breaks and a $20 billion infusion of cash into highway and transit programs. Among other things, it exempts businesses that hire the unemployed from paying the 6.2 percent Social Security payroll tax through December and gives employers an additional $1,000 credit if new workers stay on the job a full year. 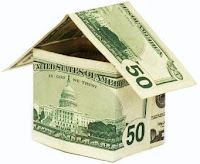 Taxpayers will have to reimburse Social Security for the lost revenue. That adds up to much more that $15 billion. Oh well, when billion is the new million and trillion is the new billion, what's a few billion dollars here and there. Seriously, the AAEA description and accompanying links to the bill should help clear it up for anyone interested in digging deeper. The other intriguing item about this bill is that many members of the Congressional Black Caucus voted against it. More than a fourth of the CBC voted against the bill. This represents about half of the votes against the measure. We guess the opponents are more in favor of the larger package that should be coming next. "The Washington Post" reporter Eugene Robinson says the trailers stored for Katrina victims that are contaminated with formaldehyde should be destroyed and not resold. AAEA agrees with him. FEMA officials want to stop the money hemorrhaging of storing the trailers, which has cost the agency $220 million for three years of storage. FEMA officials beleive the trailers are safe for occasional recreational use rather than round-the-clock living. Regardless, the trailers have already been sold and contrary to Robinson's recommendation, EPA does not have the authority to regulate indoor air pollution. FEMA's sale of nearly 93,000 towable trailers and more than 9,300 pad-mounted mobile homes drew high bids totaling $133 million, or about 7 cents on the dollar compared with what the government paid. The units were bundled into 11 huge lots and sold on Jan. 29 to bidders, whose identities have not been announced. After Katrina displaced 770,000 Gulf Coast residents, FEMA spent $2.7 billion on 145,000 trailers and mobile homes. FEMA officials suppressed internal warnings that there were health problems among 300,000 trailer occupants before declaring that trailers should be abandoned in early 2008. Congressional Black Caucus Chairwoman Barbara Lee and Joint Economic Committee Chairwoman Carolyn B. Maloney held a telephone press conference on Friday to follow-up on the release of the report and to take questions. Representative Maloney and Representative Lee pledged to aggressively address the issues included in the report. A new report released today by the Joint Economic Committee (JEC) provides an in-depth look at unemployment and long-term unemployment among African Americans and shows that both the unemployment rate and the duration of unemployment increased dramatically during the Great Recession for African American workers. “Understanding the Economy: Long-Term Unemployment in the African American Community” is the first in a series of JEC reports examining the unemployment situation among several demographic groups, including African Americans, Hispanics, youth, and women. 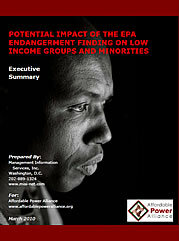 Prepared by the JEC’s Majority staff, the report draws from previously unpublished data from the Bureau of Labor Statistics, and found that though African Americans make up 11.5 percent of the labor force, they account for 17.8 percent of the unemployed, 20.3 percent of those unemployed for more than six months, and 22.1 percent of the workers unemployed for a year or more (see chart below). From February 2007 to February 2010, unemployment among African American men more than doubled, climbing from 9.0 percent to19.0 percent. Among African American women, unemployment increased from 7.1 percent to 13.1 percent during the same time period. 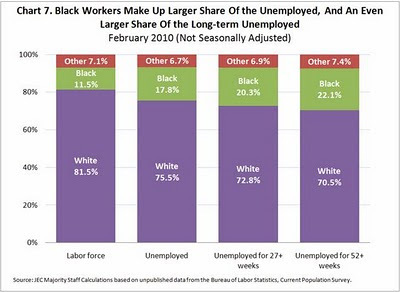 The median duration of unemployment for African American workers also has doubled, increasing from less than three months before the recession began to almost six months in February 2010. Forty-five percent of unemployed African Americans have been out of work for six months or more. Younger African American workers have faced particularly high rates of unemployment. In February 2010, more than two out of five African American teenagers were unemployed, compared to an overall teen unemployment rate of slightly over 25 percent. The Environmental Studies scholarship seeks to provide financial awards to minority and women college students pursuing a degree in environmental science or other related fields of study. Applicants should have a junior class standing in college with a declared major in environmental science or a related field, and understanding and acceptance of Service Master’s core values. This scholarship offers $5,000 per semester to two students. Amount $10,000 for the 2010-11 academic year. CBCF will disburse $5,000 at the beginning of each semester, contingent on maintaining the minimum academic requirements. All scholarship checks will be written directly to the institution of attendance and can be used to cover all education-related expenses.EligibilityApplicants must be U.S. citizens or legal U.S. residents who have a minimum 2.5 GPA on a 4.0 scale. Applicants must also be currently enrolled in a full-time undergraduate course of study at an accredited four-year college or university. The anticipated degree must be in a subject that will lead to an environmental career. The ideal candidate is a student at an accredited institution who plans to complete a four-year degree and seek work in an underserved community. Additionally, the candidate will demonstrate understanding and acceptance of Service Master’s core values. Employees or immediate family members of ServiceMaster’s and its brands, CBC Members, the CBC Foundation staff, the CBC Foundation Board of Directors or the CBC Foundation Corporate Advisory Council are not eligible. Questions Applicants can call (202) 263-2800 for additional information. The National Urban League (NUL)has announced that Dennis E. Welch, left, Executive Vice President - Environment, Safety & Health and Facilities of American Electric Power has joined its Board of Trustees. Mr. Welch is a senior executive with a wealth of experience in the energy sector, accumulated over five years at American Electric and more than 40 of years in the energy field. As the Executive Vice President - Environment, Safety & Health and Facilities for American Electric Power, Mr. Welch leads all of AEP’s environmental, safety and health activities, including compliance with all federal, state and local regulations, as well as international, federal and state public policy initiatives and advocacy. In addition, he has responsibility for forestry, real estate transactions, all corporate travel and facilities management. 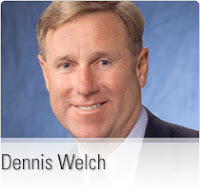 Mr. Welch was previously President and Chief Operating Officer of Yankee Gas & Yankee Energy System, an operating subsidiary of Northeast Utilities (NU) in Berlin, CT. During his tenure at Yankee Energy, Mr. Welch chaired the Northeast Gas Association for two years. A 20-year veteran of NU, Mr. Welch served as Vice President of Environmental, Safety & Ethics at NU for four years immediately prior to his position at Yankee Gas & Yankee Energy. A native of New Albany, Ind., Mr. Welch earned a bachelor’s degree in environmental, health and safety management from Indiana State University at Terre Haute and a master’s degree in business and human resource management from the Hartford Graduate Center of Rensselaer Polytechnic Institute. He also completed the Executive Environmental Leadership Program at Yale University’s School of Forestry and Environmental Studies. Mr. Welch lives in New Albany, Ohio, with his wife Elizabeth Monahan. He has a daughter, Danielle, who lives in Maryland. American Electric Power is one of the largest electric utilities in the United States, delivering electricity to more than 5 million customers in 11 states. AEP ranks among the nation’s largest generators of electricity, owning nearly 39,000 megawatts of generating capacity in the U.S. AEP also owns the nation’s largest electricity transmission system, a nearly 39,000-mile network that includes more 765-kilovolt extra-high voltage transmission lines than all other U.S. transmission systems combined. AEP’s utility units operate as AEP Ohio, AEP Texas, Appalachian Power (in Virginia and West Virginia), AEP Appalachian Power (in Tennessee), Indiana Michigan Power, Kentucky Power, Public Service Company of Oklahoma, and Southwestern Electric Power Company (in Arkansas, Louisiana and east Texas). 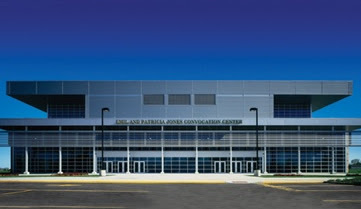 AEP’s headquarters are in Columbus, Ohio. We recently started airing new ads on TV and I wanted to share one of them with you. It features Shane Evans. Shane is not an actor; he’s a mine dispatcher at Arch Coal’s Thunder River Basin Coal Company. Help Shane get his message out! If you like what Shane has to say, help spread the word – click on the “Send to a Friend” button after you’ve watched Shane. Or, share this e-mail using one of the links below. Thanks for the email Scott. 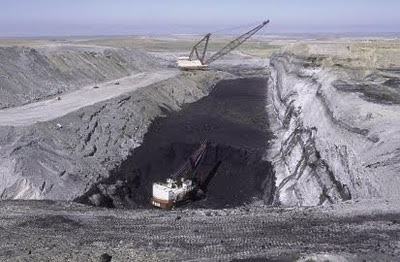 Now regarding our questions about African American ownership of coal mines: You think you can help us out with that? One of the smaller mines will do. This is the 40th Anniversary of the Original Earth Day in 1970. The Earth Day Network is coordinating activities to commemorate the anniversary. They are encouraging individual, organizations, agencies, businesses, and others to plan events to celebrate this day for the Earth. 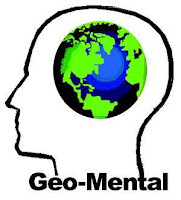 Global Days of Service – April 17-18, 2010 - will feature Volunteer Actions by tens of thousands of global participants. These projects in parks, beaches, schools and forests will focus on climate change solutions like tree planting, energy efficiency retrofits, water protection, urban gardens and forest restoration. Volunteer activities will be quantified though their events registration tool and carried out through local partners around the world. Click here to sign up as a partner! 12:00 p.m. - 2:00 p.m.Earth Day Celebration at Seafarers Yacht Club (yellow pin on map below) in Washington, DC featuring a free picnic lunch, music and presentations by community organizations and government officials. Purpose: The US EPA Administrator, Lisa Jackson, has made the inclusion of environmental justice principles in all U.S. EPA actions a priority. This Symposium will serve as a platform to stimulate innovative and bold thinking, and foster discussions, about critical topics and approaches to achieve this goal. Please join us at a Symposium to explore opportunities to better assess and address environmental justice in environmental policy and regulatory decision making. Multiple factors including social, political, psychosocial, economic, physical, chemical and biological determinants contribute to disproportionate human health or environmental impacts. Therefore, diverse expertise and multidisciplinary approaches that incorporate the perspectives of impacted communities and populations are necessary to better inform environmental health policy. Participants from diverse backgrounds are invited, including researchers, academics, policy-makers, non-governmental organization representatives, government officials (e.g. local, regional, national, tribal, international), lay experts, and students. The Symposium is open and free to the public but space is limited. President Obama Should Be Requesting Meetings With the CBC. They Have The Power. 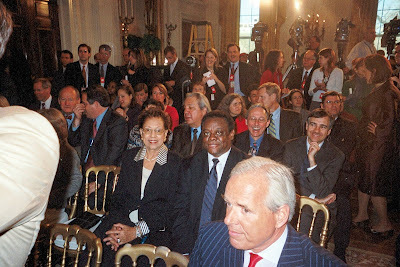 The Congressional Black Caucus (CBC) requested a meeting with President Obama and they met with him on March 11, 2010. 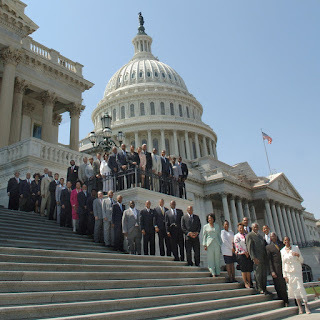 This was the second meeting of America's first Black president with the representatives in Congress who basically represent Black America. And there lies the rub. President Obama insists that he represents all of America, not the Black community in any particular way just because he is African American. This in no way is a denial about his concern for that community or identification with that community. It is an affirmation of the responsibility that the American people gave when they elected him. Now the members of the Congressiaonl Black Caucus were basically elected by Blacks in majority Black districts or districts with a very large percentage of Black voters. So in essence, they do represent the Black community. They also represent Whites in their districts as well. Yet the black community unemployment rate of about 17% compared to the national rate of 9.7% is an issue that merits special attention. Why do some people get upset over the notion of directly addressing this problem? Regardless, it is the responsibility of the CBC to police this issue. The 43 members of the CBC have the power to stop almost any legislation going through their chamber. If they exercised this power, President Obama would be chasing after them to get a meeting. It appears that a budding environmental justice movement is bracing to oppose the Vogtle nuclear power plant proposal that recently received $8.3 billion in loan guarantees from the U.S. Department of Energy. The new nuclear power plant is proposed to be located near the city of Waynesboro [demographics], which has a population of about 6,000 in Burke Country, Georgia. Waynesboro is 62% African American. Burke County is 51% African American [demographics]. [The] proposal to place a pair of new reactors in a majority black Georgia town a mere 4 miles from the existing nuclear weapons site at Savannah River and next door to Georgia Power's existing nukes at Vogtle selectively penalizes and endangers poor black communities and will cost black lives. The Savannah River, which flows between the nuclear weapons site on the South Carolina side, and the existing and proposed electric utility reactors on the Georgia side is already a SuperFund site and the 4th most toxic river in the nation, according to the EPA. AAEA President Norris McDonald delivered the keynote address at the 15th Annual Conference on Environmental Issues today in the Founder's Auditorium at Medgar Evers College in Brooklyn, New York. Approximately 250 people attended the auditorium presentation. The conference was co-sponsored by Con Edison. McDonald stated that this was one of the most inspiring events he has ever participated in and noted that the questions were the best in his 30 year career. 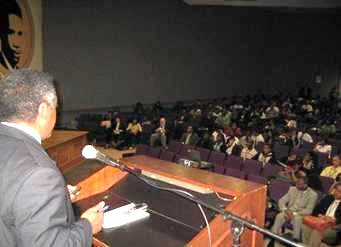 Medgar Evers College initiate this public service event, dubbed the Annual Environmental Issues Conference in March 1996. This conference has become an imporatnt venue for disseminating environmental information to the public and for environmental professionals to interact with students and community members. Today they focused on greening of the academic curriculum. The hope to demonstrate a link between a green inspired curriculum and a green economy. "While we in the colleges are developing a green inspired curriculum we must safeguard against any perception of "green" as yet another gimmick. The curriculum must stress the real-world connection of green with healthier communities, more energy efficient homes and environmental sustainability." 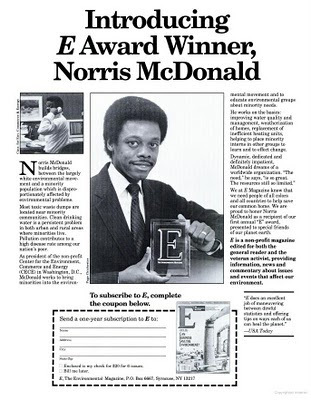 McDonald was introduced by Michael G. Flanigan, Development Manager, External Relations MEC. Drs. Wilber Hope and Mohsin Patwary presented awards. The afternoon session inluded panesl on Environmental Sustainability, Green Initiatives, and Science Panel. School of Scenic, Health and Technology. 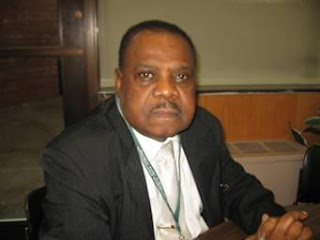 Dr. John A. Gibbs joined the faculty at Medgar Evers College, City University of New York in 1988 where he has taught basic, general, health science and organic chemistry. In 1994 he spearheaded the development of a new BS degree program in Environmental Science. This degree program, the first environmental science degree program in the CUNY system was approved by the CUNY Board of Trustees and implemented in 1996. The Medgar Evers College environmental science program strongly embraces the pressing and familiar issues of mainstream environmentalism, such as global warming, climate change, wildlife preservation, endangered species, but also gives an expanded focus to the urban environment. The program's unprecedented concentration on the environment of large urban areas fostered extensive research and studies on topics such as air and water pollution, drinking water quality, waste management, indoor air pollution and environmental health. 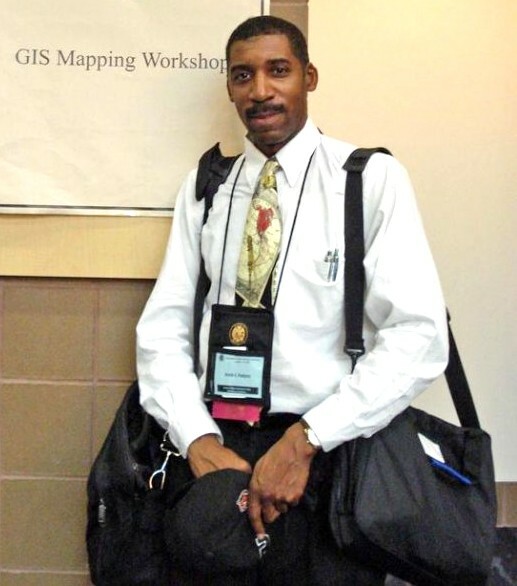 In conjunction with the implementation of the Environmental Science Degree Program, Dr. Gibbs co-founded the Annual Conference in March 2008. This conference has developed into an annual meeting place where scholars can discuss and make presentations on their research. Dr. Gibbs has guided graduates of the Medgar Evers College Environmental Science program to graduate programs in environmental chemistry, atmospheric science, soil science, occupational science and environmental education. The South Carolina State University Nuclear Science Institute has received a $100,000 grant from Shaw/AREVA MOX Services, LLC that is designed to get students interested in nuclear science. The program exposes high school students and guidance counselors to nuclear science and various fields of engineering. 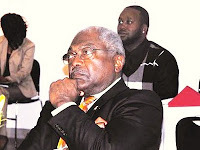 Sixth District Congressman and House Majority Whip James E. Clyburn, right, attended the grant presentation. Joshua DuBois, left with President Obama, is director of the White House Office of Faith-Based and Neighborhood Partnerships. He is President Obama's ambassador to religious gatherings, connects the president with faith leaders for spiritual counsel, helps scout Washington churches for the first family, and handles the frequent media queries about Obama's faith. Before stepping into politics, DuBois, 27, was a pastor at small Pentecostal church in Massachusetts. DuBois is tasked with overhauling the White House faith-based office and managing its branches in 12 federal agencies. 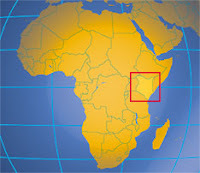 AAEA has opened an office in Nairobi, Kenya. AAEA Kenya Director Boaz Adhengo, right, has agreed to lead our environmental mission in this east African coastal nation. Adhengo is an Academic Planner and Project Program Assistant at Aga Khan University. He has over 10 years experience in solid waste management and ecological activism. His most recent publication is: "Debating Global Terrorism: Ethical Implications for Africa's Development." AAEA welcomes Mr. Adhengo. 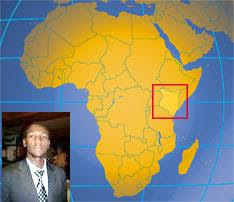 The AAEA-Kenya Office joins the AAEA-Nigeria Office, which is located in Lagos. Rhon Hayes, left, is the co-founder of Green DMV, a non-profit organization seeking to promote clean energy and green jobs in low-income communities across America as a pathway out of poverty. Rhon first gained an interest in the environmental sciences over 15 years ago while working on Brownfield issues in Dallas, Texas under EPA administrator Carol Browner. Rhon also received early exposure to environmental injustice in the Southside of Chicago while working with the EPA’s Environmental Justice Division to examine minority populations residing in close proximity to pollution-producing facilities. In 2007, Rhon co-founded Green DMV to address the most critical social and environmental concerns by educating low-income communities about energy efficient and green job training opportunities. Rhon focuses on educating small businesses in disadvantaged communities, providing environmental education in underserved school districts and working with other non-profits and community groups to reach the most vulnerable residents in low-income communities through green job opportunities. Prior to co-founding Green DMV, Rhon worked in both the dotcom and newspaper industry for nearly 7 years with Gannett Co. and USATODAY helping to build a solid information technology infrastructure to support its wide portfolio of domestic and international holdings. Rhon later joined the Center for American Progress headed by the former John Podesta, Chief of Staff for the Clinton Administration. AAEA President is an Advisor to Green DMV. The Joint Center for Political and Economic Studies (Joint Center) has undertaken a major poll of African Americans’ opinions on the issue of climate change, in which they found that more than half of black voters believe it to be a serious problem that the nation must address. In the report, "OPINION OF AFRICAN AMERICANS ON CLIMATE CHANGE AND 2010 MIDTERM ELECTIONS: THE RESULTS OF A MULTI-STATE POLL: The View from Arkansas , Indiana , Missouri , and South Carolina," the findings of surveys they conducted focus on determining how African American view climate change. It also speculates on how these views might affect the outcomes of the mid-term national elections this November.  In every state, three out of four respondents said climate change was either very or somewhat important in choosing a U.S. Senator – and in Arkansas and South Carolina, a majority said it was very important.  Even in tough economic times, a majority of African Americans in all four states would pay up to 10 dollars per month more in electric rates to combat global warming. More than one in four respondents would pay an additional 25 dollars per month.  About 9 out of 10 African Americans in all four states support government investment in green jobs, and even more support green vocational educational programs to help prepare students for green jobs. 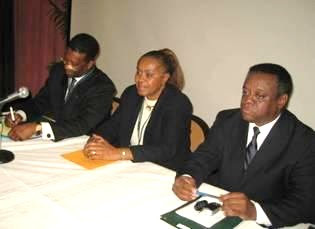 · Minority Business Round Table (MBRT). Minority and women owned businesses, utility companies, venture capital firms and non-profit business advocacy organizations are presenters and sponsors of the business building initiative. 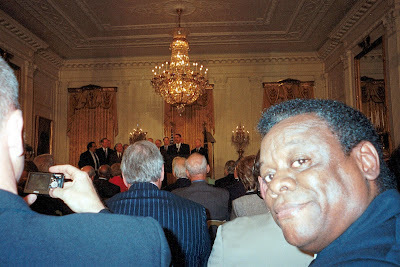 Jay-Z & Reverend Yearwood at White House: Now What? 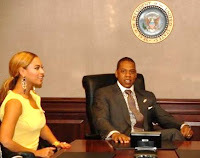 Hip Hop mogul Jay Z visited the White House this week and was photographed with his wife Beyonce and posse in The Situation Room. He met briefly with President Obama. Hip Hop Caucus President Reverend Lennox Yearwood also publicized that group's 'Green The Block' campaign at an event at the White House a few months ago. So Hip Hop is all up in the White House. Now what? Rev Yearwood is actively working on a 'green agenda.' We see him all over Washington, D.C. and all over the nation campaigning to 'Green The Block.' His recent tour went from the deep South back to Washington, D.C. and ended in a rally on the south side of the Capitol. EPA Administrator Lisa P. Jackson spoke at the event. The Justice Department announced a $6.1 million settlement Thursday with two subsidiaries of American International Group, Inc (AIG) after allegations that they discriminated against African-American mortgage borrowers. The subsidiaries are Federal Savings Bank and Wilmington Finance Inc. The department said about 2,500 African-American borrowers were victims and would each receive about $2,300 in compensation. During the housing boom some banks channeled ethnic minorities into higher-cost subprime loans, a type of loan intended for borrowers with poor credit or minimal income documentation; whites in similar circumstances received lower-cost loans. This Twitter push comes in the final days of EPA's public comment period on our coalition's proposal to ban spraying near homes, schools, playgrounds and other places where kids live, learn, and play. EPA's Public Comment deadline is tomorrow (3/5). The microblogging site Twitter is poised to hit a major milestone: sometime today one lucky Twitter user is expected to send out the ten billionth tweet (real-time counter is here). Whether you love exchanging ideas in 140-character bursts, or if U H8 the resulting abbrevs, people will be paying very close attention to the string of words that mark Twitter's ascension into the big, big time. So what will that 10 billionth tweet say? How about "Protect Rural Kids From Pesticides! Take action here:http://bit.ly/dyq39N"? What better way to announce to the world that citizens of the Twitter-sphere are informed, politically engaged, compassionate? Plus, the timing would be perfect: in just two days, the EPA ends its public comment period on a petition by Earthjustice, United Farm Workers, MomsRising.org, Pesticide Action Network, Physicians for Social Responsibility and many others asking the agency to protect children from pesticide drift—the toxic spray or vapor that travels from pesticide-treated fields and into nearby communities. So, whether you're a devoted @Earthjustice follower or a Twitter newbie I'd like you to do three things: tell EPA how important you think it is to protect rural kids from pesticides. Tweet the link (http://bit.ly/dyq39N) out to all of your followers. And then retweet. Until we hit 10 billion! If Twitter's not your thing, you can still send your message to EPA here. At any rate, I am hoping against hope that the 10 billionth tweet isn't from a pesticide-loving CropLife member rounding up the troops to shout down our proposal for pesticide protection zones around the places where children live, learn, and play. And if you doubt that CropLife is getting its message out via Twitter, check out this post. More information about ongoing pesticides campaigns. Here's more information about the ongoing pesticides MomsRising blog post. African American investors and South African entrepreneurs should establish partnerships and ownership in these new nuclear power ventures. A consortium of blacks, such as Bill Cosby, Michael Jordan, Eddie Murphy, Oprah Winfrey, Magic Johnson, Sean Combs, Jay-Z, Russell Simmons and other large black-owned companies, could pool resources and invest in nuclear power plants. They could be part of an international team that could include companies suchas as Entergy and Exelon in America and Eskom in South Africa as partners. Thus, South Africans and blacks in America would not only become distributors and consumers of electricity, but also energy industry owners. The 30 million black South Africans and the 30 million African Americans should be conducting this sort of cooperative development on a massive scale. One unique entry point for black entrepreneurs could be assisting in the conversion of plutonium and uranium from warhead triggers to fuel for nuclear power plants. America has fallen behind France, Great Britain, Russia and others in utilizing this mixed oxide (MOX) fuel. 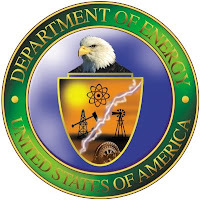 The process involves mixing plutonium oxide with uranium oxide to produce new nuclear plant fuel. South Africa dismantled its nuclear weapons program when apartheid ended. One might debate the efficacy of this decision, but the fissile material from retired nuclear weapons is a useful resource. To the extent that America, Russia, European nations and other countries with nuclear weapons want to dispose of thousands of old warheads, the nuclear materials become valuable electricity generating resources. We should also recycle spent fuel from current nuclear power plants. American blacks and South Africans could lead these 21st Century developments. Another entry point for black entrepreneurs in America and South Africa is development and marketing of electric vehicles. South Africa should become the Japan of electric vehicle exports. Today, scientist will tell you that if America retrofitted to hybrid and all electric vehicles, pollution from hydrocarbon-fueled electric power plants would virtually neutralize the clean air benefits. Electric vehicles powered by electricity from nuclear power plants would clean the air and reduce our dependence on imported oil.